Public Eviction Records: Everything You Need to Know & More! If you’ve been evicted from previous housing, you may be wondering exactly what effect that will have, and how the information will be revealed to future landlords. A good place to start is knowing all about public eviction records and how that system works. The vast majority of landlords will perform a rental background check on applicants before renting to them. This includes a check of public records for any past evictions. If you have an eviction in your past that resulted from a court judgment (as opposed to, say, your brother or girlfriend kicking you out of their apartment), you can expect it will come to the attention of your prospective landlord. Here we explain everything you need to know about public eviction records, and how to lessen the impact of an eviction in your prior rental history. Where do evictions show up in your records? In order to evict you, your prior landlord must have first obtained a civil judgment against you in court. Those court records are available for public search by anyone, including credit reporting companies. Since it’s impractical for most landlords to search out individual court records, most often they will see your eviction record in the “Public Records” section when they pull your credit report, for which you must first sign over your permission under the terms of the U.S. Fair Credit Reporting Act (FCRA). How you can check to see if you have an eviction on your record? Here’s how to find out if you have an eviction showing in your records. There are several options available to you, ranging from a free credit report to a full rental history background check, similar to the one your prospective landlord will receive. Going with a rental history background from a tenant-friendly reporting service will also help you understand what some of the terminology means when you read the report. How can I get a free eviction report to find out if I have an eviction on my record? By law, everyone is entitled to a free copy of their full credit report once every year from the three major credit reporting bureaus (Transunion, Equifax, and Experian). If you know how to read these lengthy documents, you can request yours and check in the Public Records section of the report. However, if your eviction was recent it may not show up. How long does it take for an eviction to show up in an eviction search? This depends on the speed with which the court involved uploads its public judgment records, but normally evictions appear on credit reports anywhere from 30 to 60 days following an issued judgment. 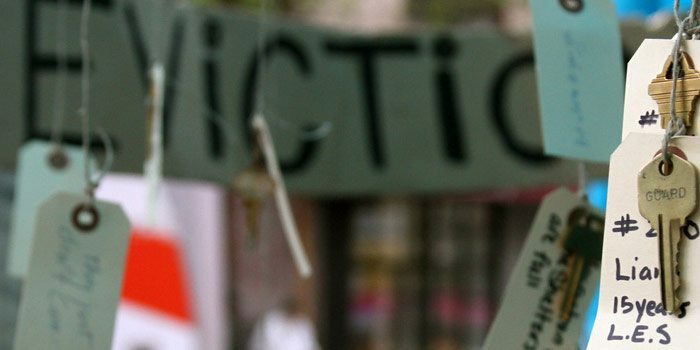 How long do evictions stay on your public record? In most states, evictions stay on your record for up to seven years. Following this timeframe, they’re deleted from public records and will no longer appear on your credit reports. How long do evictions stay on your credit report? Evictions will remain on your credit report for the same statutory period as the judgment remains in the public court records. Eviction judgments also have a significant negative impact on your credit score. What rental issues could be on my credit report? Collections: If you still owe rent from a previous lease agreement, the amount could be considered a debt after the eviction and could be sold to a collection agency. If it remains unpaid, it could be added to your credit record. Judgments: If the landlord or leasing company filed suit against you for the unpaid amount after an eviction — usually via small claims court — the judgment will appear as a public record in your credit report for seven years from the filing date. What if my rental history report is inaccurate? The first thing you’ll want to do is carefully analyze the report to make sure that everything on it is accurate. While rental history reports and credit reports are different animals, it’s worth noting that the Federal Trade Commission’s survey showed that 1 out 5 people have mistakes on their credit reports. The same could be true of rental history reports, which is another major benefit of acquiring your report before you’re out looking for a new apartment. If there are inaccuracies on your report, this gives you time to dispute them and have them removed. How can I get an eviction off my record? Removing an eviction from your public record actually isn’t that difficult. If you have an eviction record that will show up in your background check, you can petition the court in the county where the case was filed to have the record expunged, or sealed. This typically requires filing a petition with the court and paying a filing fee (fees vary widely by state – contact the county court for an exact amount). Your chances that a judge will agree to expunge a case are higher if the case did not result in an eviction. If you still have an outstanding balance from an eviction case, you should pay the balance before petitioning the court for an expungement. Even if you can’t have your past record sealed, you still have some options. While some landlords may be too busy to hear your side of the eviction situation and decline your application without looking into the matter any further, other landlords will do a little bit more digging. This might include questioning you to get your side of the past eviction, or contacting your previous landlord to find out just what went awry in the situation. The best course of action to take if you have an eviction on your record is to be upfront and honest with your new would-be landlord. Explain the situation, and take responsibility for it if it was truly your wrongdoing. Also, explain how you’ve grown as a person since then. Perhaps you’ve even made amends with the landlord that once evicted you and can contact them to vouch for you in your new endeavor. In order to demonstrate yourself as a trustworthy tenant, you may even be able to work out an agreement where you pay a higher security deposit or more rent. The bottom line is, it’s never a good thing to have a public eviction record on your rental history. But it’s not the end of the line, either. You can still climb your way back by being proactive, correcting any mistakes, and presenting suggestions that show you to be a responsible tenant who deserves a second chance.